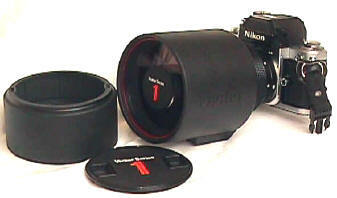 This is an outstanding, almost unknown lens. 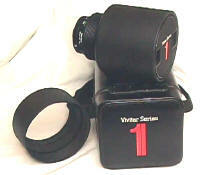 Once upon a time in the middle 1970's to early 1980's, Vivitar was a shaker and a mover in the world of 35mm photography, believe it or not. They were the first modern independent lens maker to assault the supremacy of SLR manufacturers with startlingly independent and innovative designs. The 450/4.5 Series One Mirror lens is among their very best. 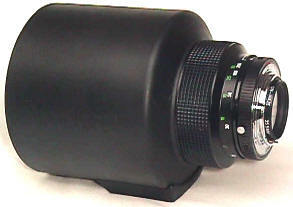 Introduced in 1983, f/4.5 is fast for any 450 lens. Yet the designers did not stop there. The front element is aspherical, and plastic!! This is one of the few uses of Aspherical lenses in mirror lenses. Apparently it was produced only a year, making it a very rare bird today. 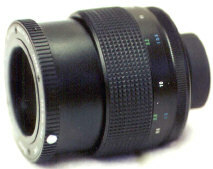 Compact for its focal length and f/stop, the 450/4.5 measures 147mm long, 117mm wide, and weighs in at 3 lbs. 10 oz including lens shade. Mounted is a standard T mount adapter, which makes it compatible with practically all SLR mounts. Just unscrew one T mount adapter, and put on another one. Features include a built in tripod socket, and specially designed lens shade and front cap. 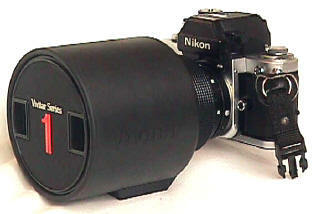 450/4.5 mounted is my faithful Nikon F2AS for size comparison. The silver catch on the Series 1 T mount adapters allows the camera to rotate. 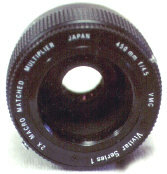 Filters are 35mm screw in at the back of the lens. 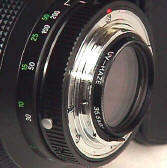 The T-mount adapter can be removed for other camera mount adapters, showing the hidden serial #. 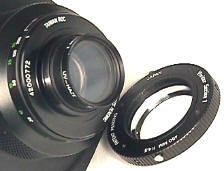 There are two types of Vivitar Series One T mount adapters. one rotates and the other does not. The rotatable Series One T Mount is the best quality T adapter I have ever found. The 450/4.5 has an unusual, and expensive, rubberized barrel and shade surface for easy gripping. The 450/4.5 came complete in it's own special case, with special lens shade, front cap, and accessory Series 1 filters in the top of the case. 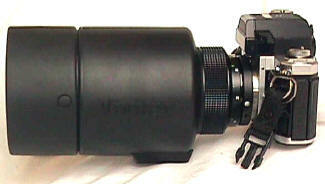 Even rarer than the 450/4.5 is its 2x Macro Matched Multiplier Teleconverter. Multiplier pics courtesy of Nelson Davis. Unfortunately Vivitar's once great lens designs are pretty much a mystery to today's Vivitar. Repeated emails and phone calls on company history are usually unreturned. Occasionally I was told "we don't have those records." Sad, for a once leading Photo Optical Company not to have a clue about itself.